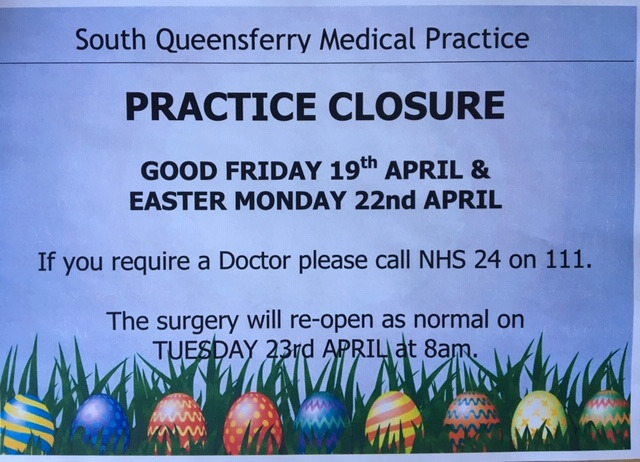 As of the 5th April 2018 , South Queensferry's Practice Boundary will no longer take in the town of Kirkliston. Existing patients living in Kirkliston will still remain registered but any new patients are asked to register with Kirkliston Medical Practice. Any change of address which is outside our boundary will result in the patient being notified to register at a practice within their area. We will continue to care for patients outside our boundary in Kirkliston as long as they remain at the address they were registered at before the boundary change took place. ALL SAMPLES must be handed to a member of the Reception Team. They should have a BARCODE on the container with the DATE AND TIME of sample added. Any sample without a BARCODE requires a form to be completed for the doctor. Pharmacy First allows patients to access free advice and/or treatment for uncomplicated Urinary Tract Infection in women or Impetigo. Your pharmacist will ask you about your symptoms in order to give you the right advice. Please contact the pharmacy of your choice to check if they offer this service. Please click Pharmacy First for more information. It is estimated that every year, 50 million visits to the GP are made for minor ailments such as coughs and colds, mild eczema, and athlete's foot. By visiting your pharmacy instead, you could save yourself time and trouble. You can find more about other sources of help by following this link. complete our registration form available below. Please bring completed form and photo ID to reception to register for this service. To find out more, please contact the surgery. Our staff are here to treat ailments that occur, as well as providing specialist management of long-term conditions and clinics covering a wide range of healthcare issues. We also host Citizen's Advice Bureau who hold clinics twice a week. Contact reception on 0131 537 4407 for further details or to book an appointment. The building includes wheelchair access and toilet facilities for the disabled. There is a car park to the front of the building with parking spaces for the disabled. A wheelchair is available for those with difficulty in walking which can be obtained through reception staff. COPD - Are you at risk?